I’ve been in Seattle for the past four days, here to attend the BARSmarts Live day which took place on Tuesday (yesterday). 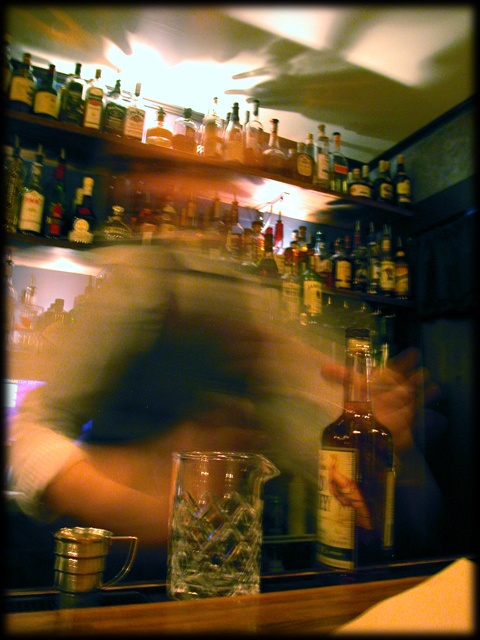 It’s certainly a relief to have the testing behind me, in particular the practical exam, which was certainly the most intense part of the program, least ways for someone like me not used to performing behind a bar day after day. More about all of that in my next post. To be sure, when not studying or attending the Live day, I made what I think was very good use of my time here by visiting as many of the LCL bars and bartenders as I could. My guide was Ted Munat, the brainfather (?) 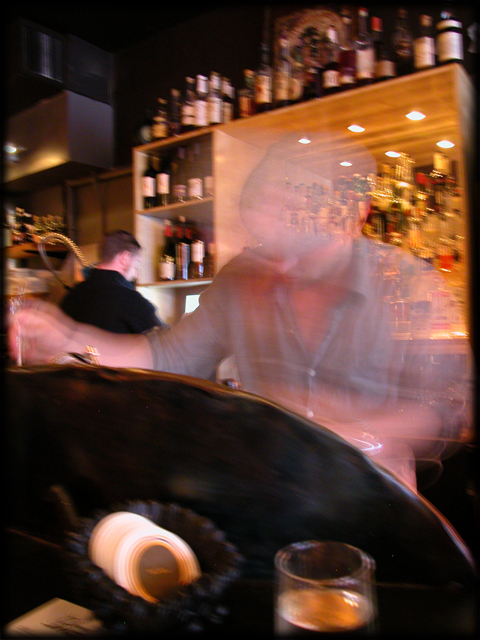 of Left Coast Libations and the force behind Le Mixeur. (Ted’s also took BARSmarts with me so we liked to tell each other we were actually studying when we got together for cocktails on Sunday and Monday. Actually I just made that up. We had no such pretense.) Here now are some notes and photos from those visits. Our first stop last night was the small and speakeasy-like Knee High Stocking Company where Jamie Boudreau is currently working. It was my first time watching him work (other than when he made cocktails for the Creme d’Yvette launch at Tales last year…we’re still waiting for product) and certainly the first time getting to try so many of his original cocktails. Most stunning of the batch was something he made for Ted using Pacifique absinthe in which an entire pineapple had been allowed to macerate ala Tequila Por Mi Amante. We tried some of this lovely stuff straight and it was simply delicious. The pineapple really complemented the herbaceous absinthe, the proof of which had been tamed by all the juice it had extracted from the fruit. I would definitely like to try this at home some time. Here’s a couple of photos of Jamie at work. Note his incredibly swift and fluid stirring technique, just barely caught on camera. I can only assume this is organic or at least pesticide-free. Before I left Anu honored me by handing me one of the silver markers and allowing me to add a cocktail recipe to the collection. 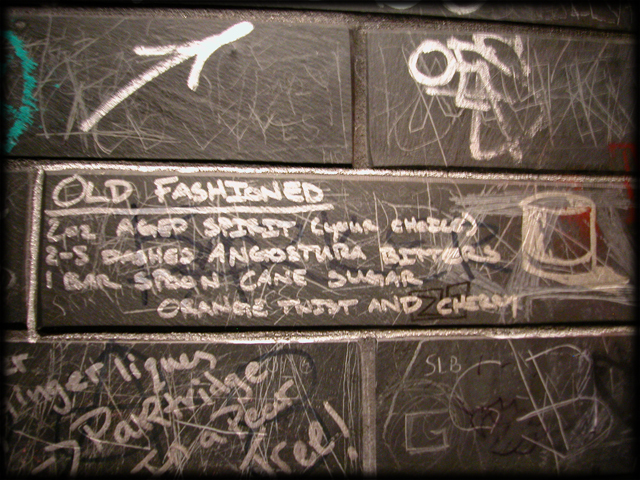 Visitors to the restroom will now note a recipe for the Brooklyn on the mirror to the left of the sinks. Ted used to live within walking distance of this bar, situated in the homey Phinney Ridge neighborhood of Seattle, across the river from the city center. The place has a definitely ‘locals mostly’ kind of vibe but Robert’s cocktail program really makes it a worthwhile destination. I had met Robert when he was visiting San Francisco the weekend we did the photo shoot for the book. 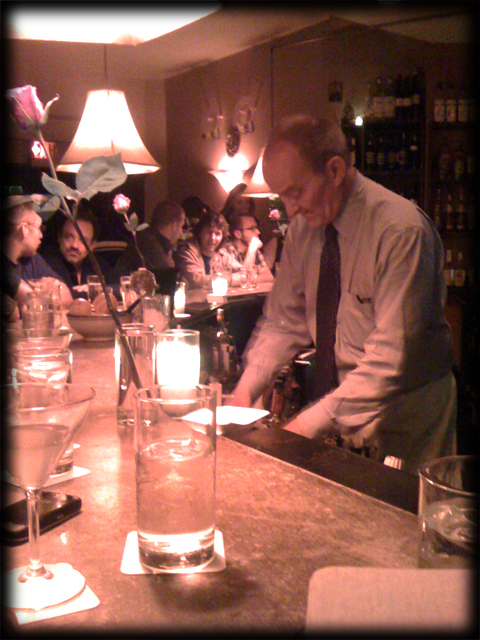 He never seemed quite ‘at home’ when behind the bar at Flora or Beretta where he was guest bartending. But at Oliver’s he was clearly the master of his domain. Here’s a photo of him demonstrating his ability to adjust his opacity to suit any situation. Handy, dude! There was a party at Rob Roy on Monday, hosted by Pernod Ricard for the BARSmarts folks. Quite the blast to be sure. A bunch of us remained cogent enough to head over to Vessel afterward. It was my first time there and I was not disappointed. However, I did fail to take a good photo of Jim or any of the cocktails I had. I know one was the Vessel 75 but I can’t recall the others. I think in part that’s because two spirits took possession of me while I was there. 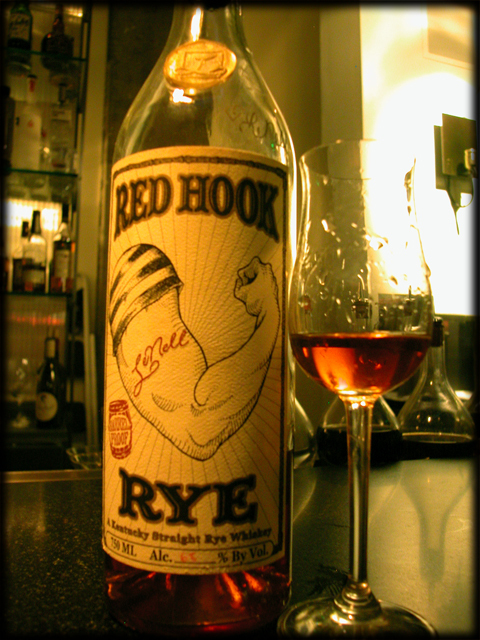 The first was half an ounce of LeNell Smothers’s legendary Red Hook rye. I had never even seen a bottle of this before. I knew it had been sourced from KBD, same as the Black Maple Hill bottles but Jim felt pretty sure it wasn’t from the same set of barrels. It was quite delicious. 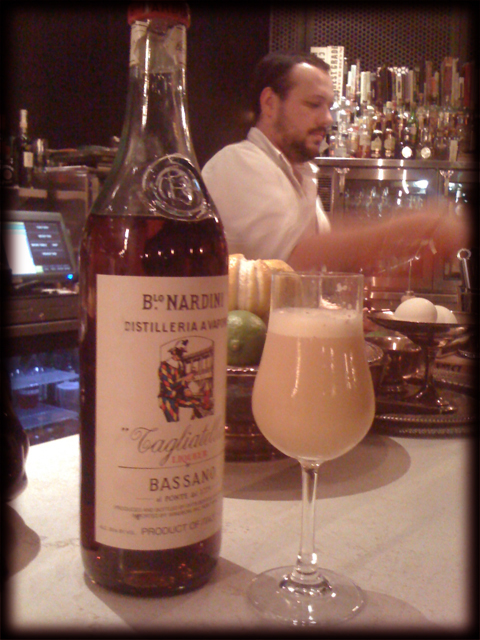 The second was downing a shot of Fernet which had been ‘enhanced’ using Vessel’s Perlini Carbonated Cocktail System. Jacking the bitter bartender’s shot with CO2 gave it slight froth, a bit like root beer. Went down really smooth. Oh, and this is kind of random, but Jim had mixed up some kind of potion using edible metallic powder from a baking supply store to make cocktails for some metal working/smelting group or thing or whatever. Anyway, when you swirl the bottle around it looks like a storm on Jupiter. I had really been looking forward to meeting Andrew. 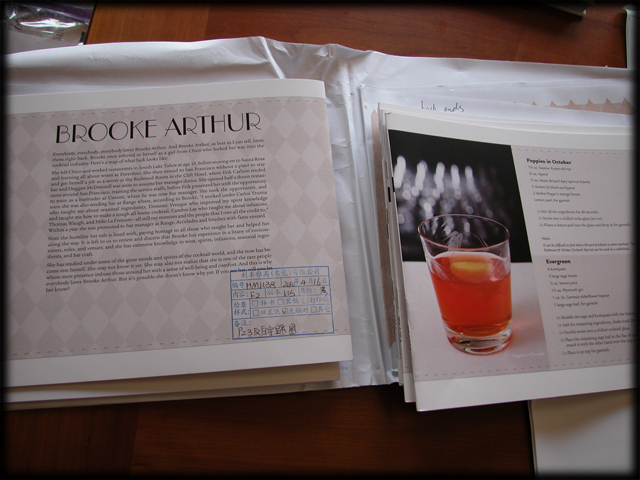 I loved making his cocktails for the book and I am a big fan of his blog, Cask Strength. Even after all the great drinking I’d done in the previous two days, Andrew’s cocktails were all standouts. Andrew started out by making me a couple of things from the menu: the Bergamot Blue Blazer (made with Earl Grey tea, served in a tea cup, accompanied by a couple of little shortbreads) and a Bee’s Knees, made with some kind of lavender syrup. Damn fine. (And what’s with the Seattle obsession with the Blue Blazer? No one makes these down here, let alone making them a regular offering on a cocktail menu.) The next two cocktails were even more exciting. First I requested one of the cocktails from the Left Coast Libations, Ueno San, named in honor of the Japanese master bartender Hidetsugu Ueno, famous for, among other skills, his hand-carved ice balls. Andrew of course serves the Ueno San cocktail over a hand-carved ice ball, a skill he apparently learned from Ueno-san himself. (I should mention that Andrew buys ice with Anu and Zane for this purpose. He had a little freezer full of pre-sized blocks which he trimmed down as needed into lovely spheres or faceted gems.) Here’s a photo which unfortunately fails to show this drink off very well. There’s a long wide peel from most of one orange spiraled around the ice ball. Second, I spied a bottle of the grappa-based liqueur from B. Nardini in Italy called Tagiatella, which is made with cherry and other flavorings and which has little or nothing to do with the similarly named pasta shape, tagliatelle. Andrew wasn’t content to simply give me a taste when I asked him about it. Instead he concocted what turned out to be an amazing flip. I was truly blown away by how good it tasted. I’m pretty sure the primary alcohol was the 6-year-old Russell’s reserve rye. I am definitely going to try to recreate this one at home. 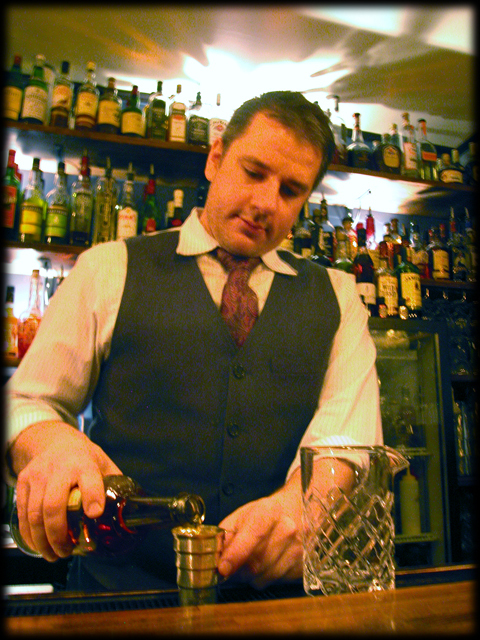 After completing BARSmarts Live on Tuesday, most everyone found themselves at Zig Zag Cafe by then end of the evening where the legendary Murray Stenson was on task. I had never seen Murray work before and I have to say the man is something of a machine. There are like 15 or so seats at the bar plus all the folks milling around at the tables. Murray was handling all of it. I thought Andrew Bohrer works hard and moves fast (and, man, he does) but Murray puts him to shame. 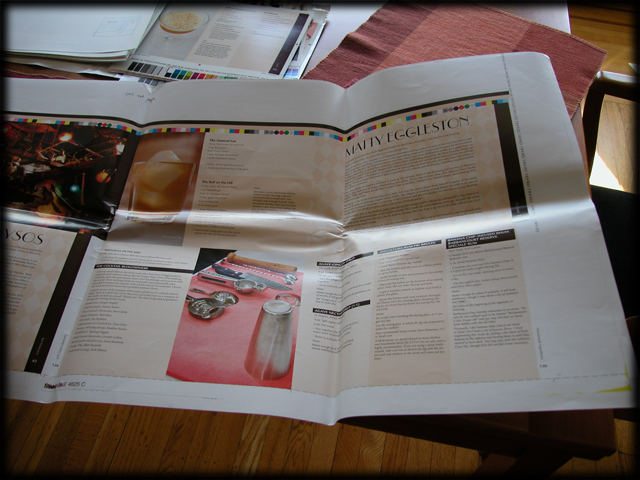 The Proof is in the…Proofs! 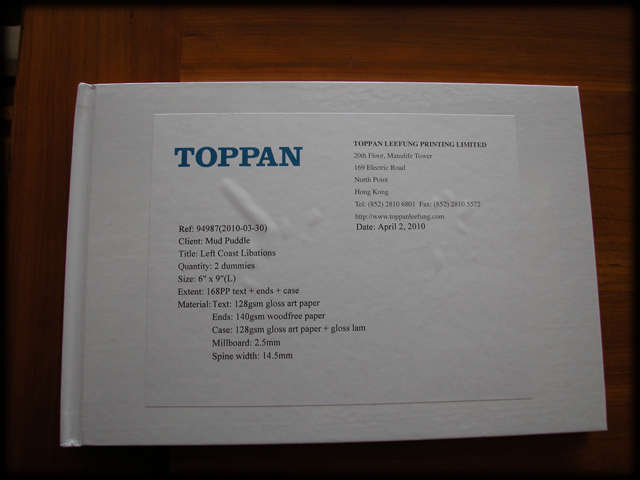 A few days ago we received a package of proofs from the printers (Toppan) in China. It’s another one of those significant milestones in publishing a book. In fact, it’s pretty much the very very last step before they put the whole shebang on press and turn over a year’s worth of love and labor into books for you. It’s also one’s last chance to change anything, should you find something wrong at this point in the process. As I write this our book designer Lisa is starting to review the proofs after which she’ll hand them off to our photographer Jenn. This is their chance to make notes which can be passed to the printer regarding adjustments to any of the images and the overall ‘look’ of things when ink is applied to paper. There’s actually quite a bit that can be done ‘on press’ to adjust color balance and tonality. Ideally you don’t want to do anything at this point but should the need arise, this is our chance to provide that input. For that purpose we’ve had two different kinds of proofs made: digital proofs for all the photos and so-called wet proofs that show how the pages will look when real inks (and not toner) are used to reproduce ’em. 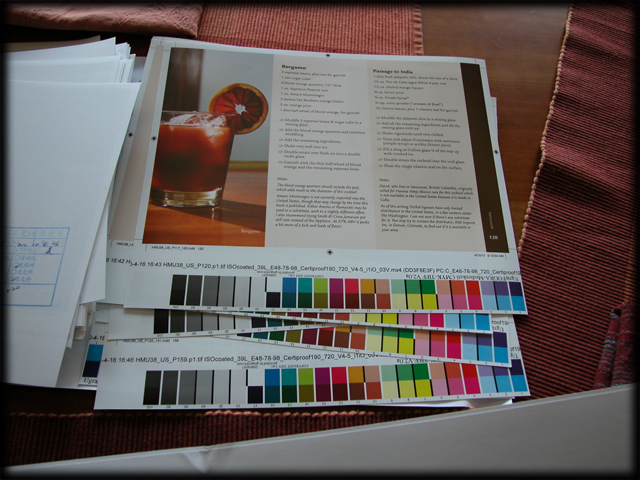 This is especially important for Left Coast Libations because in addition to the standard CMYK ink set we are using two additional spot inks (AKA Pantone Solids) for the page backgrounds. Up till now we’ve only seen what these will look like as simulated by an ink jet printer. Did you follow all that? Good. Celebrate with me and have a cocktail! Yum! In less than a month we should have a real version of the book to show you here, one of the advance copies we’re having sent back by air. A few lucky reviewers in the long-lead national press will be the final recipients of those. 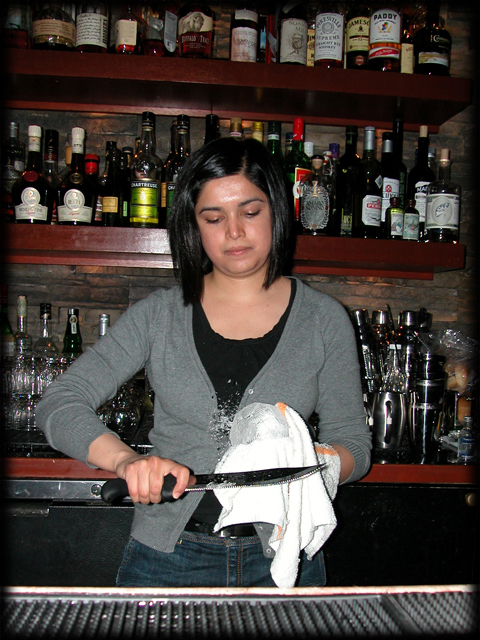 Last Friday was Brooke Arthur’s last evening as Bar Manager at Range. Folks (OK, bartenders) were dropping by to say good-bye to her there and bid her good luck at Prospect, Nancy Oakes’s latest restaurant, where she’ll be managing as well. Those of us who stopped in were treated to a Brooklyn for which Brooke had so very kindly brought in her own bottle of Amer Picon from Spain (I think she said that’s where she got it). Only in writing this post did I realize how totally appropriate and fitting that selection was. Now it’s Sunday. A beautiful day here in Oakland, California. I’ve got a few racks of baby back ribs smoking slowly in the Weber. A perfect time for a cocktail on the back deck. Remembering Brooke’s Brooklyn I decided to make one of my own, undoubtedly to slightly different effect using, among other things. Wild Turkey rye, Dolin blanc and my bottle of Amer Boudreau. Yummy never the less and more importantly, worth raising, in toast, to Brooke, where ever she may be today! Cheers! Stir over ice to chill. And…We’re Off to the Printers! 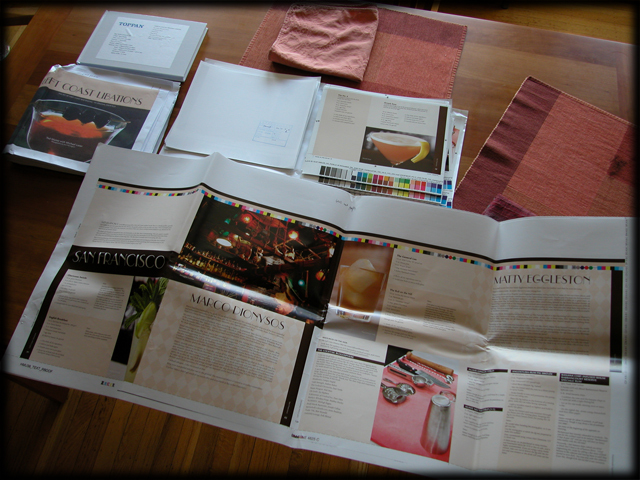 Last week we sent the completed print package for Left Coast Libations off to the printers, with no small sense of relief. All of last month was consumed with putting the finishing touches on the book: getting final hi-res color delivered, collecting releases from all the bartenders (herding cats, mon), completing the copyright page information, dealing with Library of Congress, building the index, adding a last minute section at the end for bartender updates, getting photos for our bios, etc etc. And now, that’s all done. Of course, as anyone who’s had a book printed knows, that particular stress was replaced almost immediately with concerns about things we might have missed (and that we’re going to find when we get our very expensive proof back to review) or problems in the print package itself (like missing fonts). It’s a never ending cycle of labor and joy, joy and labor. One really really cool thing we did in February was to send out early versions of the book as PDF to solicit quotes from key industry folks. These are the sorts of things you need for the back cover and for press releases which get generated before the book is made generally available for review. Amazingly enough not only did we get a 100% response from everyone we approached but everyone got back to us within a month. We didn’t have to follow up or cajole anyone. I am told that’s not always the case. I will be hosting a large cocktail event next month. 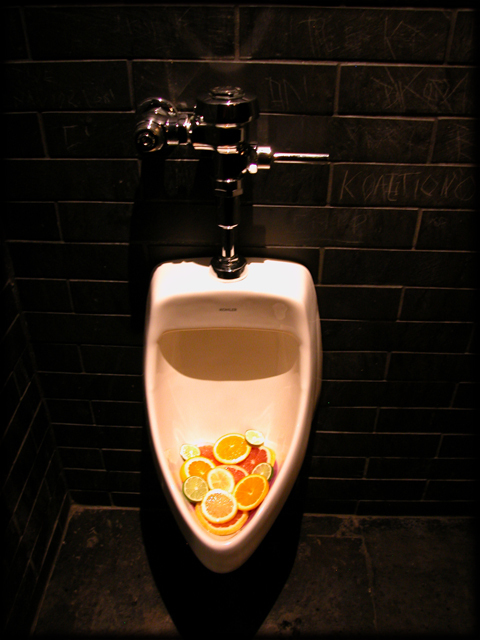 We’ll be serving a selection of drinks from Left Coast Libations, naturally. 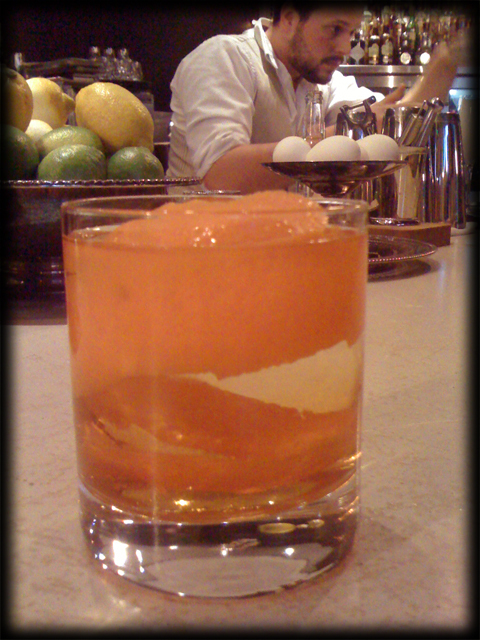 One selection will be Jim Romdall’s El Globo Rojo which uses a homemade ingredient from Charles Baker’s A Gentlemen’s Companion. 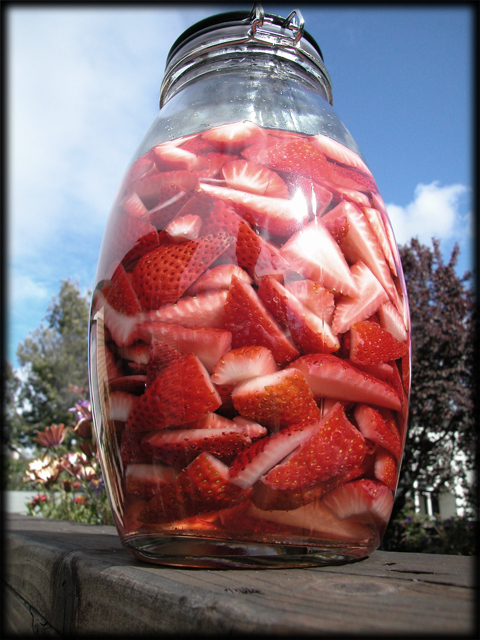 Here’s an (enormous looking) jar of what will become Tequila Por Mi Amante in about four weeks time. Slurp! Does the Manhattan have an evil twin and if so, what would it be like? 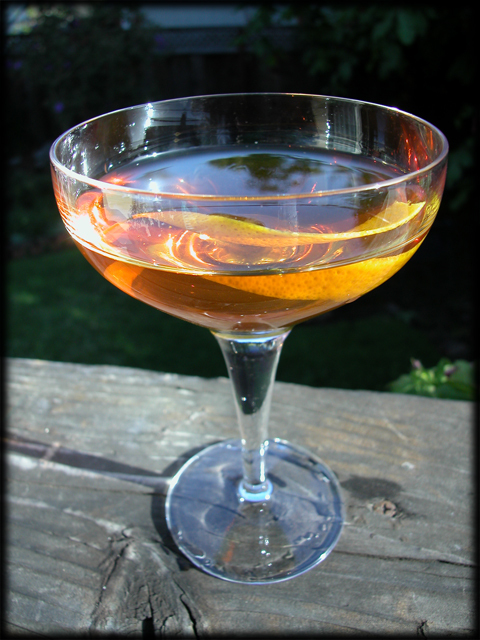 Keep to the Manhattan template as closely as possible, following the 2:1 ratio of spirit to vermouth and to include a bitters. Use a high-rye white dog as the spirit. 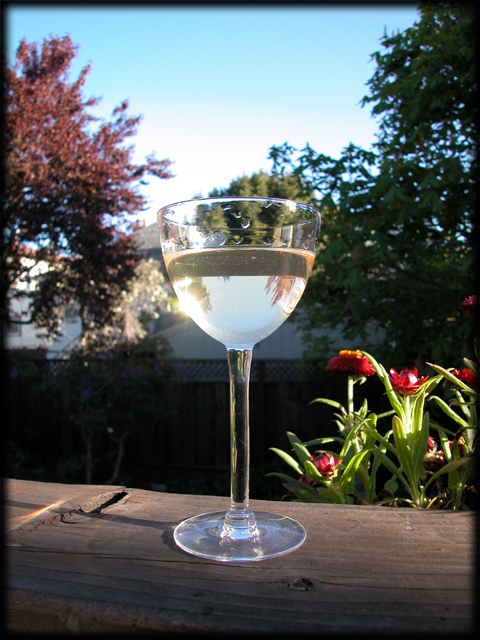 Use a French-style vermouth such as Dolin blanc or Lillet blanc. 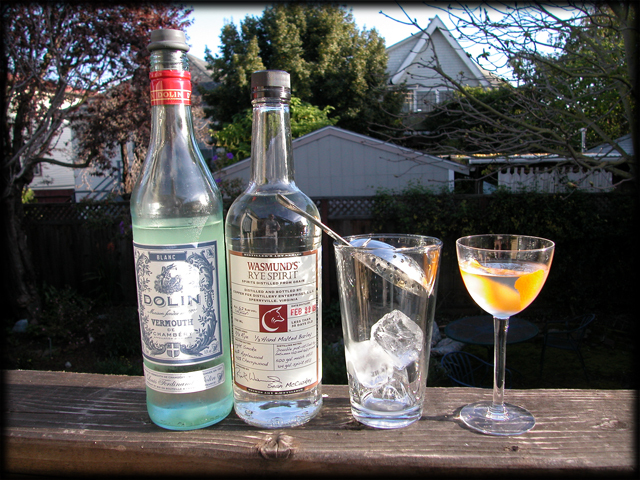 Use a bitters which adds little or no color to the cocktail. [*] Erik says they are making one at Nopa but are using Death’s Door White Whiskey which is bottled at a much lower proof than the Wasmund’s. Neyah is also using Benedictine for the sweet component, but more about that below. There are several rye-heavy offerings available (and more coming it would seem). A trip to Ledger’s Liquors in Berkeley turned me into the owner of bottle of Wasmund’s Rye Spirit from Copper Fox, made from a mash of 2/3 rye and 1/3 malted barley and bottled at 126-proof. According to the label it’s run off a pot still at 150- and 160-proof, which leaves plenty of grain character. Trying it neat, I could easily detect both the spice of the rye and the sweetness of the malt, which had been itself given a light fruitwood smoke when it was kilned. The whole production made me think of a rye genever except with a lot more kick. Use a liqueur (ideally colorless) to bring back some of the sweetness and complexity that an Italian-style vermouth would have contributed. 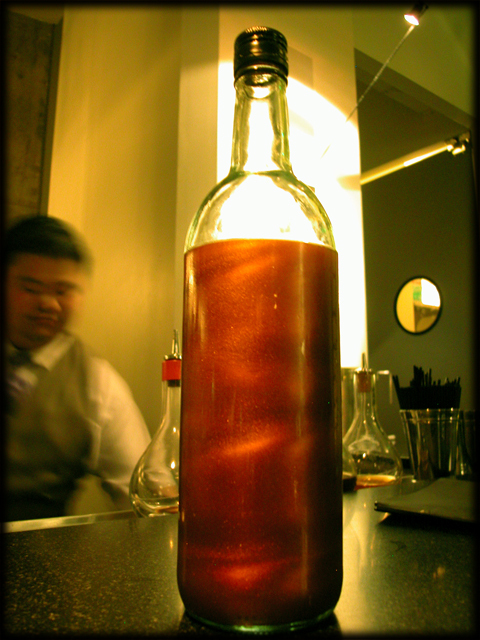 I also found that I really missed the complexity that a “dark” bitters like Angostura or TBT Old Time Aromatic adds to a cocktail. The Regan’s, much as I like it elsewhere, just didn’t seem to bring all that much to the mix. This was more like it. Still on the dry side, the Cointreau brings plenty of orange and sweet into the mix while the Angostura seemed to amplify the smoky/woodsy malt components of Wasmund’s. A winner! 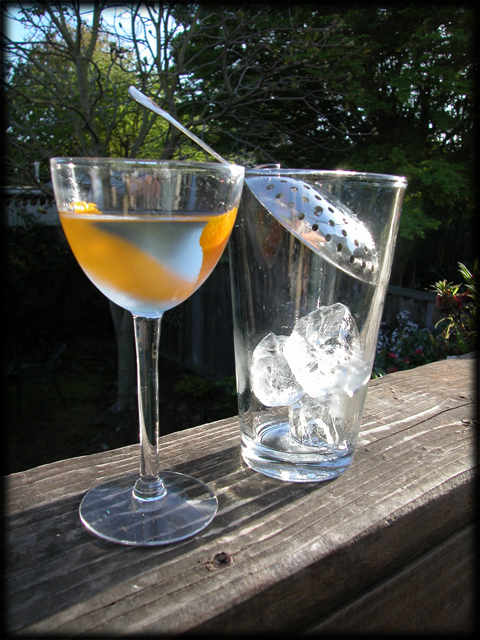 I’ll continue to tinker with the White Manhattan—I’ve got a few more ideas up my sleeve—and report on any new variations which I feel merit a write up. I was going to let the photo speak for itself but it occurred to me that I might at least make a small suggestion. 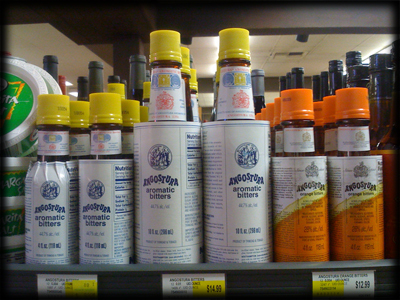 If you haven’t yet tried a straight shot of Angostura and if you are a lover of things bitter, like Fernet, you owe it to yourself to pop the shaker off your yellow-topped bottle, pour yourself a full ounce of the pride of Trinidad & Tobago and toast to its triumphant return to retail. Cheers!